The Utility of a Real-time Microblogging Service for Journal Club in Allergy and Immunology. Dimov, V.; Randhawa, S.; Auron, M.; Casale, T. American College of Allergy, Asthma & Immunology (ACAAI) 2009 Annual Meeting. Ann Allergy Asthma Immunol., Vol 103:5, Suppl. 3, A126, Nov 2009. Internet-based services are an important source for communication and reference information for fellows in training in allergy and immunology. Our aim was to explore the utility of the free microbloging service Twitter.com to make the journal club educational activity more interactive. We used the text message and Internet interfaces of the free microblogging service Twitter (http://twitter.com/) owned by Twitter, Inc. to post updates and summaries from the journal club activities at an Allergy and Immunology fellowship training program at an academic center. The updates were posted on a web site provided free of charge at http://twitter.com/AllergyNotes and simultaneously distributed to the cell phones of subscribers via text messages. The web site was freely available and comment were open to visitors. One fellow in training was assigned to update the microblogging service from his cell phone with the label "#JCAllergy" for easy referral and later retrieval from the Internet search interface. Five articles were discussed during a 2-hour journal club teaching session and 24 updates with links were posted on Twitter.com. The updates were followed in real time by 2 fellows at an Allergy and Immunology training program in a different state (not physically present at the meeting). Five fellows (out of 7, 71.4%) at two training programs expressed a favorable opinion of the use of the microblogging service to post updates from journal club. The microblogging service Twitter can be used to share information from journal club in allergy and immunology and thus serves as an easy to implement form of distant learning for trainees and community allergists. The service is free to use and requires minimal equipment limited to an Internet-connected computer or a basic cell phone (not a smartphone) with activated text messaging service. A potential limitation of this approach may be the distractions that the reporting journal club participant may experience while simultaneously sending text messages and listening to the presentations. Twitter allows an immediate feedback from the journal club participants, following the updates from remote locations, which can enhance the educational aspects of this activity. The concept of a journal club on Twitter has its own limitations inherent to the publishing medium and the enthusiasm of the participants. After a few months, we decided that the concept was interesting but ultimately the discussion of a journal article requires more than 140 characters. I wish them best of success in this new educational endeavor. I think it is a great effort and it should be strongly encouraged. My general comment on the 2008 concept, and this new 2011 version of journal club on Twitter, was that “we need to go beyond this 1950s model rather than adapt it to social media”. To be exact, Sir William Osler established the first formalized journal club at McGill University in Montreal in 1875 (http://j.mp/aGEvB0), but the concept itself seemed to get traction after the 1950s. I think it would be a good idea to ask the participants themselves what they would like to see in a journal club on Twitter, i.e. "crowdsource" the community. This can be done via a Google Forms poll with a free text option for additional suggestions. Dr. Stuart Flanagan tweeted that this could be an opportunity to develop or even reinvent the Journal Club model, and it could be a very exciting project. I agree, and will try to add a few specific ideas in a future blog post. If we stay just on Twitter, this may look like another topical Twitter chat. For example, what are the major differences between "Journal Club on Twitter" and a Twitter chat on a topic? In addition, Twitter may not be the best way for article discussion. It is just the popular tool at this time. Google Buzz is an alternative service that works well for this purpose but the major problem is that very few people use it. Buzz is a better medium than Twitter for a journal club from a technical point of view. It is easier to follow the conversation threads - this is one its main advantages and Facebook has it too. The search function of Buzz works well while Twitter Search traditionally “forgets” tweets older than 7 days. How about Journal Club on Facebook? I don't think that JC on either Facebook or Twitter (or blog comments) take the concept to a fundamentally new level. In conclusion, from personal experience, I would say that you can only learn when people criticize your project - it is the most helpful kind of feedback that you typically get for free. Please consider visiting the website and Twitter account of this new Twitter Journal Club (http://twitjc.wordpress.com), follow the hashtag #TwitJC and enjoy the new editions. @DrVes: Right. Different from what we typically do here, e.g. discuss every detail of a recent (very recent) article, focused on one topic. Twitter Journal Club: yet another ‘revolution’ in scientific communication? 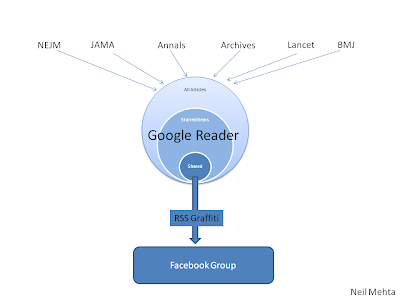 BMJ http://t.co/NrB7KAJ - Any plans for Google+ Journal Club now? Interesting to hear some of the history of Twitter journal clubs. As you rightly say, I think there is a cultural difference between the UK and US on the idea of a journal club. This is perhaps one reason why there are differences of opinion. I do disagree with your comment "I don't think that JC on either Facebook or Twitter (or blog comments) take the concept to a fundamentally new level." This whole idea is fundamentally different to the example you describe, it is not about tweeting updates from an already existent journal club, it is about conducting a discussion purely in the virtual world. This allows inclusivity on a global scale without hierarchical boundaries, something which is very rarely, if ever seen in 'real-life'. I look forward to hearing your ideas about developing the model; I think it is one that can only get better.